Many different types of gases are consumed in industries as varied as chemicals, food & beverages, and medical. These gases are normally delivered in liquid form by trucks and dispensed at the customer site. 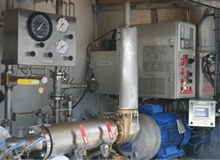 Although the flow volume of cryogenic liquefied gas is used for billing purposes, it is not easy to accurately measure this because the gas is always at saturation temperatures. Also, gathering billing data from each truck without delay is becoming more difficult because each truck needs to deliver gases to more customers at increasingly distant locations as demand increases. When the truck driver presses the start button, the controller starts a pump to circulate liquefied gas for cooling down the flowmeter. Liquefied gas is then dispensed to the site tank. Data of the flow volume measured by the cryogenic version vortex flowmeter, temperature, and pressure are acquired by the controller via FOUNDATION fieldbus. These flows are compensated to base temperature (15°C) from the current temperature using gas density tables (N2, O2, CO2, Argon) by selecting the gas type at a local HMI. On completion of each dispense, the dispensed flow data is saved in the controller and a daily report is created at the end of the day by compiling all the dispenses. Daily reports are automatically e-mailed via wireless communications to the office for billing purposes. Yokogawa provides a sophisticated and highly accurate automatic custody transfer system for cryogenic gas delivery. The following features are provided by combining the STARDOM "FCJ" controller, the DY cryogenic version vortex flow meter, the pressure transmitter, temperature transmitter, and a local display. 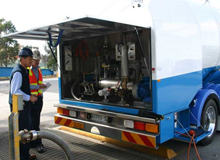 When the truck driver presses the start button, the controller starts a pump to circulate liquefied gas through the pipe until the temperature falls low enough for single-phase liquid flow. If this can not be achieved within a given time frame, the controller stops the pump, displays an "error" on the local HMI, and returns to be idle. When the temperature is low enough, the controller opens the valve and dispensing starts. Until the flow stops, the controller totalizes the flow volume and saves this data. At all times, the temperature is monitored. If it goes too high, the controller displays an error message on the local HMI. Yokogawa DY cryogenic version vortex flowmeter covers process temperatures as low as -200°C with high accuracy (liquid: ± 0.75%). 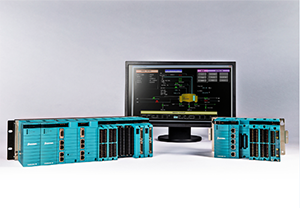 Measured data is transmitted to the controller via FOUNDATION fieldbus, all-digital technology, so that accuracy is not degraded through A/D conversion. Flow correction for several gases can be performed in the controller by selecting the gas type on the local HMI. Temperature density tables (N2, O2, CO2, Argon) are loaded onto the controller in CSV format. When the gas type is selected on the local HMI, a Java application on the controller loads the corresponding CSV file and sets the data as arrays to an IEC function block. This IEC function block compensates the flow volume to the base temperature. Thanks to the combination of IEC and Java applications, flow correction for different types of gases does not require application modification. Each time dispensing is completed, the corrected/uncorrected flow and temperature, pressure data are saved in an Excel compatible CSV file in the controller's compact flash memory. At the end of the day, a report file is created by compiling all the day's dispensing files. For billing purposes, the created daily reports are e-mailed to an office via GSM/GPRS or some other type of wireless communications. Also, these reports can be uploaded to a PC using the FTP function and opened in Microsoft Excel. The operator interface is connected with the controller on the truck via a serial link. The operator can monitor the corrected total flow, temperature, sequence status (idle, cooling, dispensing, finished), and alarms on the main display and scroll through detail pages such as uncorrected total flow, uncorrected/corrected flow, uncorrected/corrected cumulative total, number of dispenses, and density. Parameters such as pump pressure, cooling timeout, and K Factor can be also set. The compensated flow and temperature trends can be monitored on a Web browser at a remote site by accessing the controller's URL. Logging settings and report files configurations can be set on a Web browser as well.